I was surprised when the smaller and weaker of the two caterpillars was the first to complete his metamorphosis into a chrysalis. He didn’t attach himself to any of the twigs or plants, but instead transformed on the soil. Today I noticed the larger caterpillar, who has been very still for days, had spun a web and seems to be beginning his metamorphosis too. Can you see the thin thread of web anchoring the caterpillar in place? 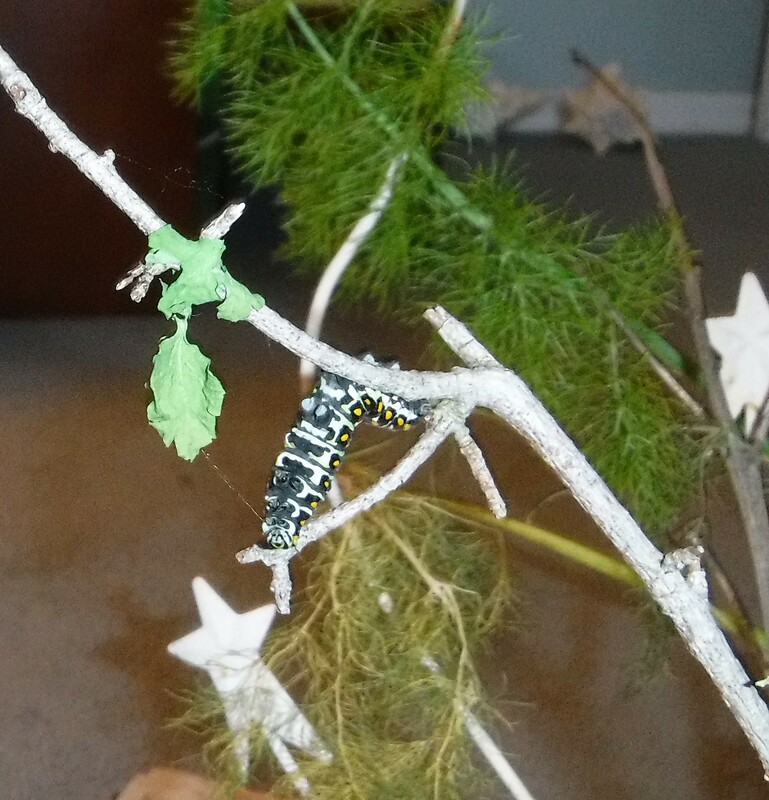 I’m leaving a place holder below for a photo of the second chrysalis, probably complete by tomorrow morning. Check back for the posted photo. I removed the photo place holder I originally posted. The caterpillar is very still, yet has not formed a chrysalis. As the days pass I am losing hope that he will begin metamorphosis. Something seems to have gone awry. Oooh ! Where is the photo ? I like the smaller one beat the larger one to the chrysalis and that he decided to roost on the soil. Hi Susie, He is still his old self, the new transformation hasn’t begun. If he/she hasn’t changed by late afternoon I will post a photo and update in another post later. Thank you so much for posting this update. Wonderful they are successfully transitioning to the chrysalis stage. The second one is still not changed…the room is very cold as it is upstairs and gets late sunshine. I am wondering if this might have something to do with the process slowing down. Wow this is beautifully captured!! Thanks so much. Still no change in the second metamorphosis…will be posting as it happens. When the caterpillar is in his chrysalis he’s called a pupa. In this stage the caterpillar digests his own body to create his butterfly form. 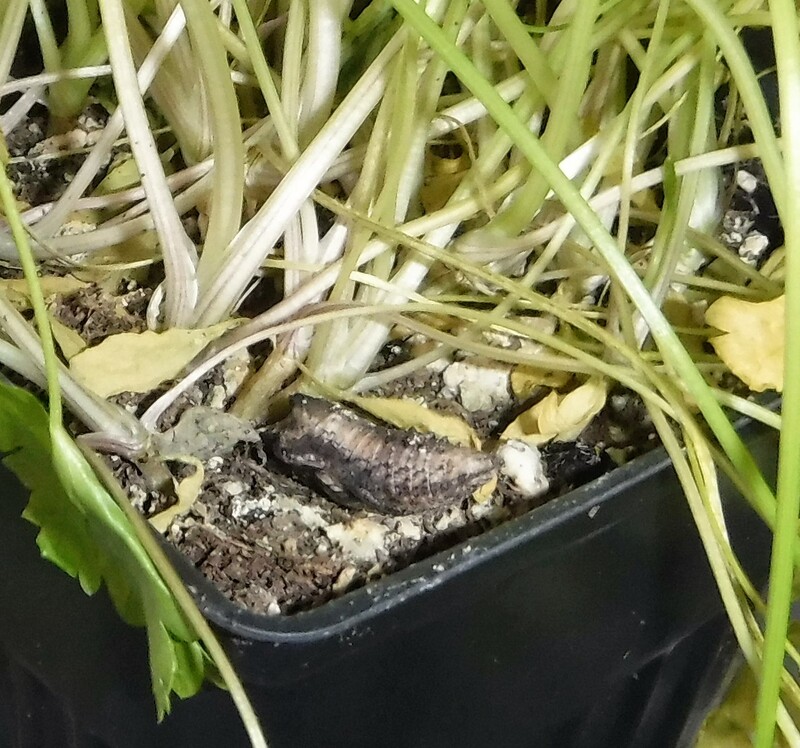 Although the pupa doesn’t need food in this stage, he does need moisture. If you’re caring for a chrysalis, mist the cage to keep the pupa healthy. When the chrysalis turns dark or clear, the butterfly’s about to come out of the chrysalis. The timing varies by species. Monarch butterflies generally leave the chrysalis within 48 hours once it turns dark, according to the University of Kansas Monarch Watch website. Great information Janie. I will use it in a future post in case someone else give this a try. I am going to try and keep it cool…cool enough to keep them in their cases. The room they are in is very cold…goes down to the 50’s in the night, and still cool through the day. We keep our heat low. Misting is a good tip also good to know what stage to call it. I didn’t know he will digest his own body. So interesting. I will use this for sure in the future. I went researching after your prior comment about the possibility the cold was slowing down their metamorphosis – was also wondering if temp. was a factor. This was how I discovered the above mentioned site. I also didn’t know they digested their own body. Fascinating info.